If you didn't have the balls to see the Part One, you probably still don't for Part Two. After all, if Alfred E. Newman's motto was "What? Me worry? ", then the liberal motto ought to be "Why face facts?" Based on the book written by Ayn Rand and released in 1957, The Atlas Shrugged movie series is an accurately frightening reflection of the effects of collectivism on America today. Transforming great books into great movies is tough. Some of the best novels ever written have been absolutely mangled by the movie industry. View almost any film based on a Stephen King novel and you'll see my point. 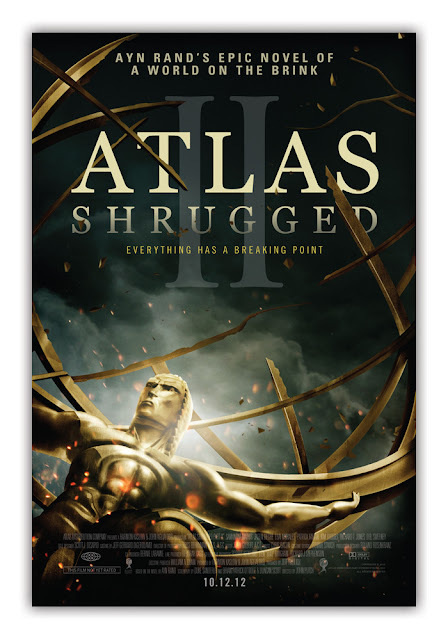 Nevertheless, the producers of Atlas Shrugged have done a masterful job of interpreting a very long and very complex novel into a movie that can be understood my the common person without insulting the intelligence of those who actually read the book. If you haven't already, take the time to see Part One. I plan to watch it again just before seeing Part Two. Then check out Part Two when it hits theaters. See the movie parts and compare the scenarios played out in them to what is happening in America today. Even if you disagree with the Objectivist philosophy within, at least you'll be among the informed. If not, well, never mind. After all, why face facts? Part One is available on Netflix and its trailer is below. The trailer for Part Two is beneath Part One.